This Caroline Daybed will fit anywhere with its clean, uncomplicated lines, capturing the uniqueness of our times. Constructed with a carbon steel frame for stability, the gently sloping 48-inch back panel and 34.5-inch side panels are welded for strength. The medium matte gray Flint finish is coated by electro-statically applied powder paint with a lacquer coating for durability. The 3-piece panel set is stabilized by (4) 1.5-inch diameter corner posts, topped with stamped steel finials. This charming daybed has a light airy feel that will make a perfect addition to any office, family room or bedroom. 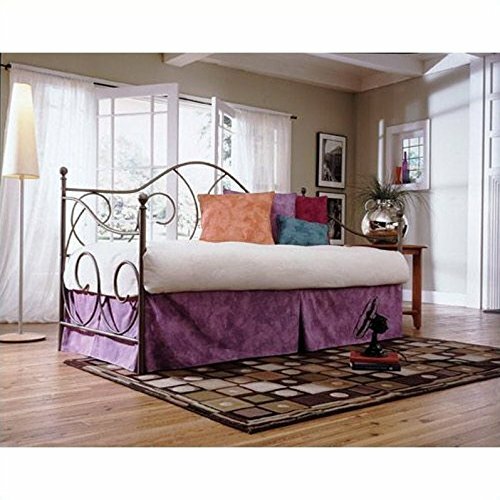 A 12-inch space between the floor and daybed base will store the included Trundle Bed Pop-Up Frame. This unit measures 48-inches (H) x 79.38-inches (W) x 37.5-inches (L), and includes a link spring, back panel, (2) side panels, pop-up frame, instructions, and hardware bag with everything needed for assembly. This cost-effective Caroline is also available in an Antique White finish (# B10193). A mattress is not included with this daybed. The Fashion Bed Group Caroline Complete Metal Daybed comes with a 10-year limited warranty against manufacturing defects. The Fashion Bed Group, a division of globally diversified Leggett & Platt Inc., is an industry leader in the production of fashionable beds, adjustable bed bases, top of bed textiles, bedding support and barstools. By keeping a close eye on the design community and other fashion and decorating sources, Fashion Bed Group stays on top of the trends and knows the right mix of finishes and innovative designs to continually provide quality crafted products at an exceptional value. If you have any questions about this product by Adjustables by Leggett & Platt, contact us by completing and submitting the form below. If you are looking for a specif part number, please include it with your message.